Today (August 15) I had the great pleasure and honor of attending the final convocation for the 2014 NYU GSTEM program. At this event, 41 young women who are rising high school seniors presented the work they did this summer interning at various science, technology, engineering, and mathematics departments. The presentations were incredible and if I hadn't known they were high school students I would have thought they were just finishing college and on their way to graduate school. Today the future looked very, very bright. Like, genius bright. 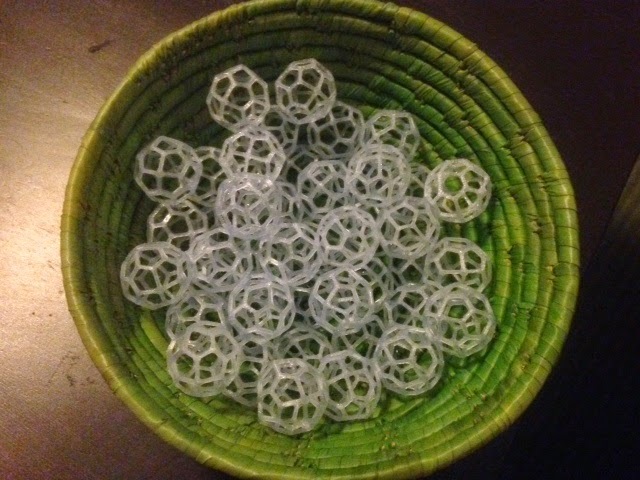 We made them each a Pentagonal Icositetrahedron (see Day 197). Settings: Printed at 50% scale on a MakerBot Replicator 2 with .2mm layer height and raft but no support (hooray!). Print time was about 21 minutes a piece and they printed eight-up without problems.